Almost seven years ago I wrote a post about a couple I called The Lovers. It's pretty long, but you can read it here, if you want. Basically it's the story of a love affair which came about when two people were in middle age and how they fell in love and how they spent a long time trying not to be in love and how they finally gave in to that love and let the chips fall where they may and all of this was back in 2010. Or at least, it was 2010 when they decided that it was time to simply be together, no matter what, and so they did. 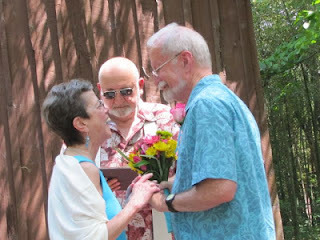 A little over a year after that, when the dust had all settled, they got married in my back yard. The link to that story is here. Here's a picture from that day. Even before they got married, Jan began to have health problems. One thing after another. She got so tiny. She was tiny before but soon, she was like the slip of a slip of a girl. She looked so fragile and she had to have surgery and she had to get chemo and every time I saw her I wondered how in the world such a teensie woman could still be living but I'll tell you how- because her flame burned bright as the brightest star in the night sky and because Jack loved her so truly. They got to go to England and do river boat cruises twice. They were in more plays and productions at the Opera House. They pressed on, as Jack always told us to do when he was directing plays. He'd give notes and then he'd say, "Press on!" Those days in the Opera House before our beloved Colin got sick and before Kathleen got sick and before Jan got sick were some of the best times of my life. My god. We had such fun. Remember the parties I used to throw with those good people with pizza and martinis? Remember the radio plays, the silly murder mysteries, the Jezebels? And then Colin died and then Kathleen died and with them, my joy at being in the Opera House disappeared and I haven't been in a play or production for forever and ever and I haven't seen Jack or Jan in quite a while but I do see Judy and Denise who came to be part of our little family there and occasionally I'd run into another friend from there and we'd always say, "Have you seen Jack and Jan?" and for awhile it seemed that Jan was doing better and we'd all be so glad but then a few days ago we all got an e-mail from Jack that Jan was in hospice care and today we got another e-mail that told us that she'd died in his arms yesterday around 2:00 PM and that although he is heartbroken, he is so blessed to have known Jan, to have loved her, to have married her. It's raining tonight. I am thinking of Jack and of Jan so very, very tenderly. Of their love and how very obvious it was to me from the first moment that I met them that they were meant to be together. Of how right it felt when they finally said, "Enough is enough and life is short and we are meant to love each other." I am thinking of them like this. I am hoping peace for Jack, even as I know that his heart truly is broken. 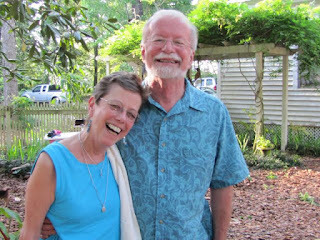 He and Jan shared faith in their church and I know that they believed in life everlasting and I hope that that faith cradles him as he presses on in this life wherein his love has gone on before him. I have no more words. The rain falls and I can hear the cars swish by on the highway and I am thinking about times past and how in the end, it truly is only love that matters and how that love can come out of the blue and how the only response is to accept it with great joy and grace. Jan and Jack did that. My god, but they did. Yes they did. It's incredible how many wonderful people we've met because of that building. Who knows how they would have come into our lives otherwise, but I'm forever grateful they did. We could cast a pretty great show with the people we've lost from there. Hope to see you soon . I am so sorry for Jack's loss, and yours, too. I'm sure the rain matches your mood, but you can count yourself as lucky that you knew her. Sending hugs, Mary! I remember when you shared their brave love story and my heart aches for Jack, you and everyone who loved her. Such a lovely gift to them, is your tribute here. Bless them both. I remember that post all those years ago. And many if the other things you mentioned. Colin and Kathleen and plays. And now another milestone. And I'll remember this one too. Peace to all of them and to you. How much more comforted Jack will be because they had the courage to seize the time they were together. At least they had that. This is a tender and beautiful tribute. I am so sorry for the loss of your friend. I am sorry for this loss. This post is a wonderful tribute. Oh, Mary. How do any of us survive it all? I came in at the very end of your opera house days. life is short and there is no point in denying love even if it turns out to have been short lived. how does that go? I'd rather to have loved and lost than never to have loved at all. It's fundamentally a happy story. Amid the sorrow, that's the thing to keep in mind -- as you are doing, it sounds like. You are correct, it is truly only love that matters. So sorry for the loss, and such a lovely tribute for a beautiful love! How beautiful their love was and this tribute to her. I am so sorry for your loss Mary. Blame The Beatles Why Don't You? And Why And Where And How And Who?